When I saw the article on Kotaku about a S.T.A.L.K.E.R. spiritual sequel, I immediately sent the link to every gamer friend I have. The thought of a game developed in the same style and by many of the same team members was exciting. I almost pledged $20 to it, but I checked the comments section on that article. Now I'm glad I didn't, and here's why. First of all, creating a game the scope of S.T.A.L.K.E.R. on a brand new proprietary engine that works on three operating systems plus three game consoles is a massive undertaking. Even if each of the listed developers put forth their savings (and being game developers, that probably isn't much,) $50,ooo is a very small amount of money. On top of that, they only have one listed programmer. Then there's a founder/CEO of the supposed studio, a writer (who is supposedly ex-Spetznaz (which is totally badass,)) a PR woman, three concept artists, at least four "game designers," and an animator. Given the massive teams that work on games of similar scale, it really is not plausible that they can have any sort of real progress on the game. Dozens of people would need to be hired, and a $50k budget won't even cover one person's salary. Some quick Tineye reverse image searches also reveal that at least one of the concept images is from S.T.A.L.K.E.R. and another is the cover art for one of the supposed writer's books. Given that the game is supposed to be based off of it, that might not seem that odd, but I find it strange that they cropped any indication that it was the cover out and passed it as concept art. Subjectively, I also don't think the concept art shown gives a cohesive feel of what the game is supposed to be either; they seem more like they come from different places. Most concerning is a forum post by one of the developers at Vostok Games. The studio was formed mostly out of ex-S.T.A.L.K.E.R. 2 developers after the game was canceled and sent into legal hell. 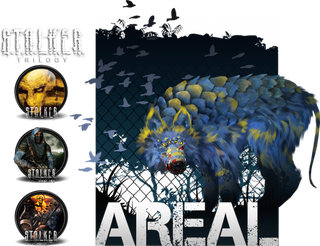 When someone posted a link to the Kickstarter for Areal on their forums, one of the devs responded "We have contacted GSC's lawyers regarding this fraudulent claim of being the developers of Stalker and Metro Last Light. Please do all you can do ensure people know these claims are false." I would love for this Kickstarter to be real, but there are too many red flags. The price, the concept art and video, and Vostok's reaction to it are far too suspicious for me to consider pledging any money. If you already did, I would highly recommend backing out of it and letting things play out for a couple weeks. There's still a month left on it, so if they can clear some of this up in time, all will not be lost. If it ends up being fraud, maybe we can keep a bunch of people from losing money on it and go back to clinging to hope we can get a new S.T.A.L.K.E.R. in the future.